I have a huge passion for the performing arts. Especially acting. Every single day when I wake up, I get out of bed and I think about what steps I can take to improve my career opportunities, and enjoy the talent that presents itself in performance arts. On one of these morning in the spring of 2018, I was online and found an advertisement to be and extra in a film called “Blue Love” by Helena Rose and Matthew Marshall, for m & s Marshall Productions. I messaged Matthew Marshall who is the film’s director also and he added me to the list of extra’s and sent the dates and times of the filming days. He told me that there was several days that I could be a part of in the film. I just about hopped off my chair, I was so excited. That feeling hasn’t changed. I couldn’t believe it I was going to be in a movie! Before I knew it, the date for my first every scene arrive and I was on set. Just being on a film set meant so much to me. I couldn’t believe that I was a part of this. It was a dream come true. It all became reality that “I AM IN A MOVIE!” when Matthew first said “action.” I was so excited. I watched the scene play out, and the talented actors where amazing! I have enjoyed my time working with iFilmGroup and m & s Marshall Productions. I have been a part of the dramatic film "Blue Love" and have been a part of various activities with iFilmGroup. I have been a part of filming footage for the iFilmGroup promo and promotional shots for the group for the website and social media. I very much enjoy working with the entire iFilmGroup team. Don Hickey the Community Engagement Manager has opened many doors for me, as has other members of the crew. Matthew Marshall is a kind-hearted, friendly, and welcoming person to everyone that is on his set. Reza, the photographer helps you to relax and laugh. As an intern he helps you to feel less nervous about being on set which allows you to relax. This was especially helpful the first time you’re on set. The cast and crew make everyone feel important, because everybody is important on an iFilmGroup set. I have got to meet many great people through iFilmGroup. All who have made me feel like a part of the team. It has been great being able to be together and talk about film and the iFilmGroup with people like Don, Chassidy, Anna, Maysee and Reza. I feel so lucky to be working with such an amazing and inspirational group of people. Finding the iFilmGroup was so amazing. For someone like myself that is into dance and acting. Finding this group is a dream come true. They offer an opportunity to be involved with films that you can’t get anywhere else in the area. I really enjoy working with the iFilmGroup to create amazing films and to learn many things about acting and film. 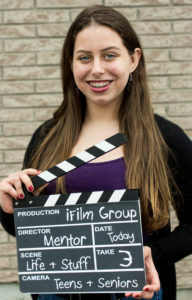 The iFilmGroup is an amazing group providing experience in film making for youth and seniors. I love acting for Matthew Marshall under his direction. It has been a pleasure to be able to work with the iFilmGroup production team as well as the rest of the cast and crew. I can't wait for more opportunities to be a part of this group.